Hotel Kristian is located in Šumava, in a small village called Kubova Huť. In 2017, the hotel was completely renovated to offer you the best quality accommodation in the Bohemian Forest and you could spend an unforgettable vacation here. Massive Šumava beds, stylish rooms, modern bathrooms, excellent restaurant in Šumava and an indoor heated pool – all prepared for your best experience. The unique Boubín Forest with its dominant Boubín lookout tower, you can find a great number of hiking trails and cycle paths. 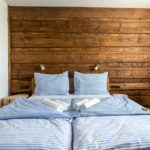 Ideal accommodation in Šumava for couples or families with children. Come, We are looking forward to you!